You may not feel ready for fall, but the official heralding of autumn -- given that the PSL now returns at entirely arbitrary times -- has come: A new pumpkin king has been crowned. His Pumpkinhood is named Steve Geddes, and he won a first-place ribbon at Deerfield Fair in New Hampshire on Thursday for a pumpkin that weighed an astonishing 2,528 pounds, reports The Boston Globe. Not only did Geddes take home a ribbon and $6,000 in prize money, but he also gets to brag about owning the biggest pumpkin ever grown in America. And we agree. It is both a big pumpkin and a big deal. While this is the biggest pumpkin ever grown in North America, it doesn't take the cake (the pumpkin pie?) on the world stage. 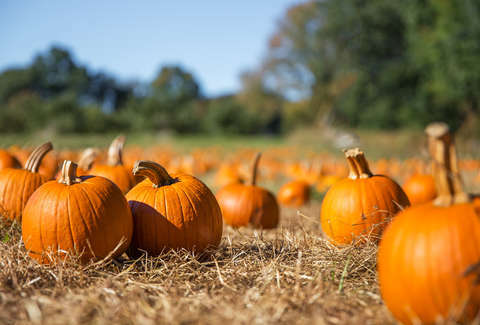 According to Guinness World Records, the biggest pumpkin ever was grown by a Belgian man named Mathias Willemijns and weighed 2,624.6 pounds when it was recorded in 2016. That's over 100 pounds larger than this one. Look, Geddes may not have set the all-time global record, but we believe he deserves some recognition, even if he isn't the true Pumpkin King. He's at least the Pumpkin Duke or something.